Serena Jameka Williams, born on 26th September, 1981 is an African-American professional Tennis Player and a former World Number 1. She was born in Saginaw to Richard and Oracene. However she was brought up in California. It was in here that she won her first tournament at the age of 4 and continued competing with her elder sister Venus William, whom she succeeded to as the No. 1 player in the state. The talent in the two sisters was noticed by their parents and their father sent them to be trained in a tennis school by Rick Macci. Racquet used by Serena Williams: Wilson BLX Blade Team Racquets are used by Serena.Presently Serena Williams' Racquet brand is The Wilson Brand Racquets. Serena Williams Boyfriend: Brett Ratnar, Jackie Long are the two Boyfriends known about of Serena williams. Favourite surface of Serena Williams: Hard surface. Serena turned pro only at the age of 14 in 1995, just a year after her sister Venus. Her first professional event was in September 1995, at the Bell Challenge in Quebec City. She lost in the first round itself. In 1996 she didn't play a tournament and the next year lost some consecutive matches before winning her first main draw match in November at the Ameritech Cup Chicago. In 1997 she finished ranking World No. 99. 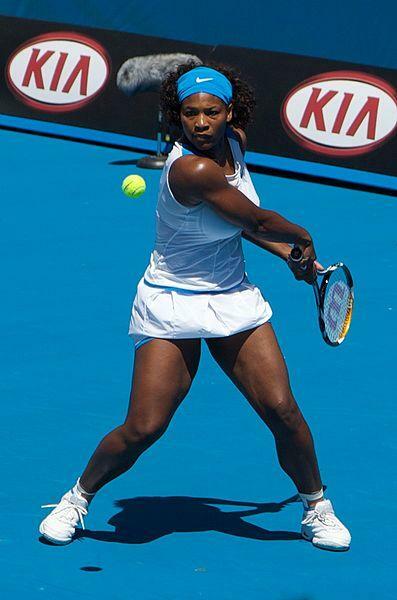 In 1998, Williams began at the Medibank International Sydney. As a qualifier ranked World No. 96, she defeated World No. 3 Davenport. William made her debut in the in the main draw of a Grand slam tournament at the Australian Open and lost to her sister Venus Williams. This was the sisters' first professional match. She however won the mixed doubles title at Wimbledon and the US Open, with Max Mirnyi, completing the Williams family's sweep of the 1998 mixed doubles Grand Slam tournaments. Serena won her first Professional title in the doubles in Oklahama city. Serena and Venus became the third pair of sisters to win a WTA title. She finished the year being ranked the World No. 20 in Singles. In 2002, Serena won the French Open and Wimbledon Tournament for the first time. Having 8 singles title gave her the long desired title of World No. 1. Serena's left knee injury in 2003, kept her away from tennis for some time. Yet still she managed to play 8 events that year and managed to keep Serena Williams current rank to World No. 3, winning both the Australian Open and Wimbledon. In 2004 she unpredictably lost to the newcomer Maria Sharapova and the next two years were ruined because of a chronic knee injury. She even fell out of the top 100 WTA rankings for non- participation. She managed to climb back only in 2007 to the top 10 after winning her third Australian Open. Serena's service is recognized as the best among women in tying with her sister Venus for the fastest service by a woman in a WTA tour for a 129 mph serve. Serena is famous for Serena's fashion statement. Her peculiar colors and weird outfits in the court are discussed by all. Stanford Final, Serena Williams beats Bartoli. Serena Williams won over France’s Marion Bartoli at the Bank of the West Classic. This was her come back match and her first title since the Wimbledon 2010.To know more about this Serena Williams vs Bartoli match check the wiki article below.